How does one prepare for running a 5km lap race for 6hrs? That’s a very good question, as I’ve never done anything like this before. I know I’m good at working with a distance goal, so I estimated that I would be able to run 50km in that time and based my plan on that. 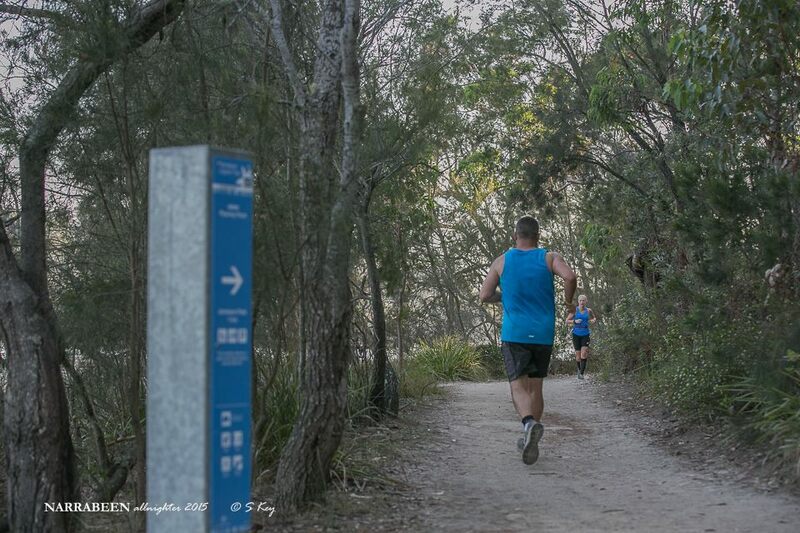 So I picked up my teammate Brad on Saturday afternoon around 7pm and we headed for Jamieson Park in Narrabeen. I parked the car and we walked up to the registration area to collect our bibs, t-shirts and buff/cooler (the gear was very cool) and then headed back to the car to pick up all our gear. We ran into lots of familiar faces, some fellow competitors and others who had come to cheer off the start. There was a really nice buzz in the air and it set a great mood for the start. We setup an area with a table and chair and offered the team location to my mates who I had convinced to take part in the event too, it was the least I could do. Somehow I had managed to convince my good friends Maria & Emma to enter and they teamed up for the challenge. plus another friend Tom from SHRunners had dived in for the 12hr trail solo event, his first ultra!! Brad, Maria and Tom readied themselves and we all headed over for the race briefing at about 8:10pm (a little late). There was a 12hr road race happening as part of the same event, just on a separate 1km lap (!!!!!) tarmac course, however the runners cross paths for a brief section which was the location of the timing mat. Each group took up their posts and shortly after the countdown began…. and they were off. I knew I had about 30-40mins before I would see my mates again so I took the time to have some food and water and also to chat to other runners and supporters. Despite the humidity there was actually a cool breeze flowing and I ended up putting on a jacket and blanket to keep warm. I stayed awake till about 10:30 and got to see the runners come through for a few laps. The comments were all about how hot it was (they were covered and dripping in sweat) and how boring it was (oh no!!). I saw my mates a few times and then then made a beeline for the car to try and get some sleep, and although I nodded off a couple of times they were only for very short periods. My small Yaris is not built for 6tt tall people and I was quite stiff when I got out of the car. My alarm went off at 1:00am but I was already awake. So I got my gear together, got changed and headed over to stretch and get my food and electrolytes out ready. When I got back to our gear location I had just missed seeing Brad and Maria, but they were both on track to hit their 50km targets. 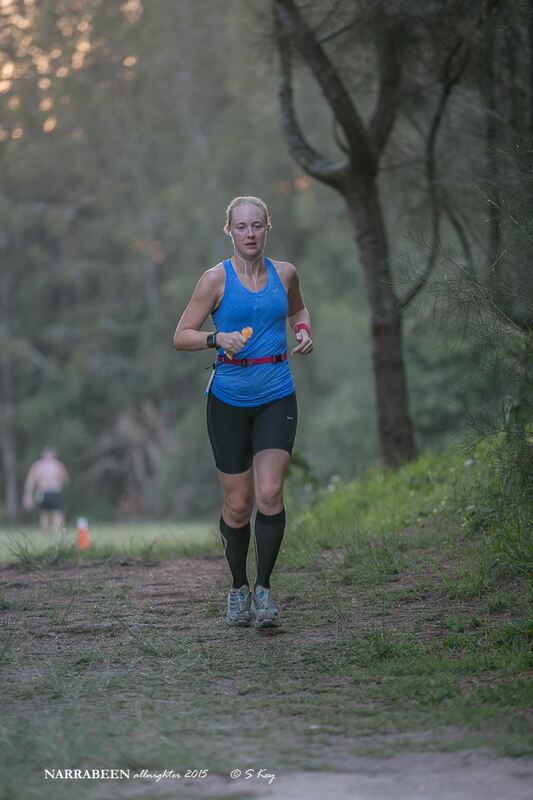 Maria came flying in just before her last lap, the little pocket rocket wasn’t going to let anything stop her from achieving 50km and she smashed it with 10mins to spare. Well done Maria!! And only a few mins later Brad came flying through the checkpoint reaching his 50km goal too. What a champion!! So Emma and I readied ourselves to start and chatted nervously with the other runners doing the same. It was great to see Sam Isbell toeing the line too! We were all a little sleepy but ready to go. The 6hour alarm sounded and we were out running. I felt very sluggish to start but eventually fell into a rhythm and Emma and I ran and reminisced about Oxfam and other running funnies from the past. It was great to have her company. We actually saw a snake on the first lap but luckily it was only a python (not poisonous) and we continued around it on our way. During the night I also saw about 3 possums and decided they had sharper claws than we so let them cross before i continued on my run. I can’t remember at what time or km they were (I wonder why) so I thought I’d just mention it here. And then I took a tumble. After the turnaround and when we got closer to the snake location again, someone told us it was up in the tree, so as I was looking up I tripped on a rock and went flying knees and hands first onto the gravel. I got up and dusted myself off, hands were ok but the knees took most of the fall and the right one was bleeding. I told myself to run it off and Emma asked if I was ok, I told her I was (even though it was starting to throb) but that’s because I wanted to stay positive and I thought I could run it off. And it worked for a while, so I took some pain killers later in the race and it helped me get through. It wasn’t a sharp pain so I didn’t think it was anything too serious, but it just didn’t feel quite right. I’m not sure what else to mention as there’s not too much to mention when doing a lap race. We had a beautiful full moon which lit a most of the trail and some runners didn’t even use head torches (crazy if you ask me, more risk of tripping). The course had a lot of rocky gravel areas and a little bit of concrete at the turnaround point. I ran on the grass next to the path a few times as its softer on my legs, but there was also a ditch you had to be careful of, which luckily Em pointed out to me. Emma lives only 10mins drive from the course so was a local and had run this track before. I kept up with Em for as long a I could, which turned out to only be a few laps, then told her go ahead and I slowed to a more comfortable pace that I was used to. Most of the laps ticked by pretty quickly and although I had some negative patches around the 20km mark I just kept running and drinking lots of water and electrolytes at each of the ends, plus a few gels along the way. I was dripping with sweat so needed more water than normal, and many of the guys ran shirtless throughout the night due to the humidity. I looked forward to the high energy music and cheers from the start/finish area on each lap. I tried to guess the song that would be playing next and then sung whatever was playing for the start of the next lap. Great idea for the music guys!! Thanks!! The best part of the course were the other runners, some of them who had been out there since 8pm the night before. 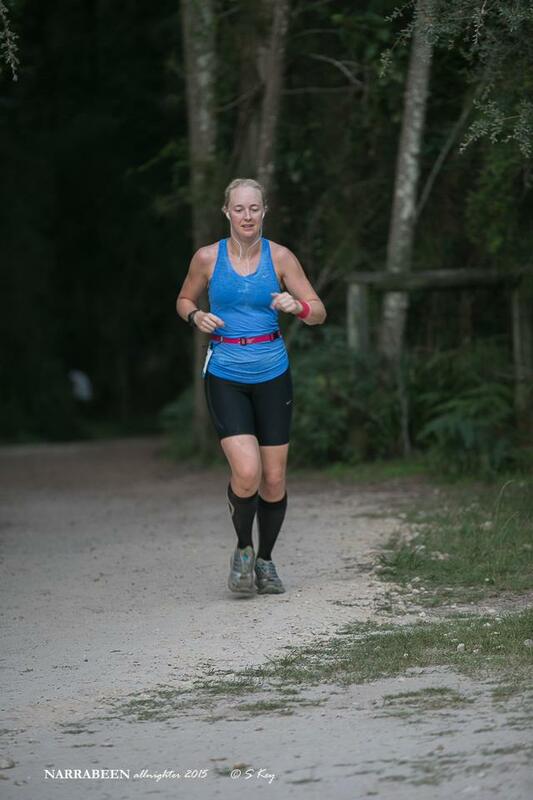 I love chatting and helping others so I made a point of smiling and encouraging as much as I could, which is hard to do in the dark when all you can see is headlamps. This task was much easier once the sun started to rise and I think we all felt relief once we could ditch the headlamps and the finish drew closer. It was so good to finally be able to see the other runners faces. 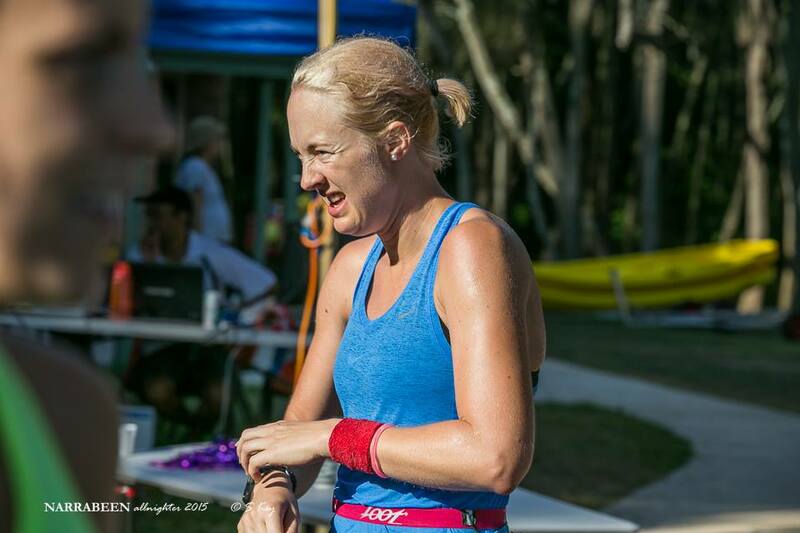 The encouragement and support from other runners, not just the ones I knew, was awesome. My smiles and encouragement were returned by all but 1 (grumpy looking tattooed) runner who never responded and didn’t even look up once despite my cheers lap after lap, maybe he was suffering. My buddy Tom doing his first 12hr/ultra was still out there going hard, Emma had lapped me and was looking very strong for 60km (!!) 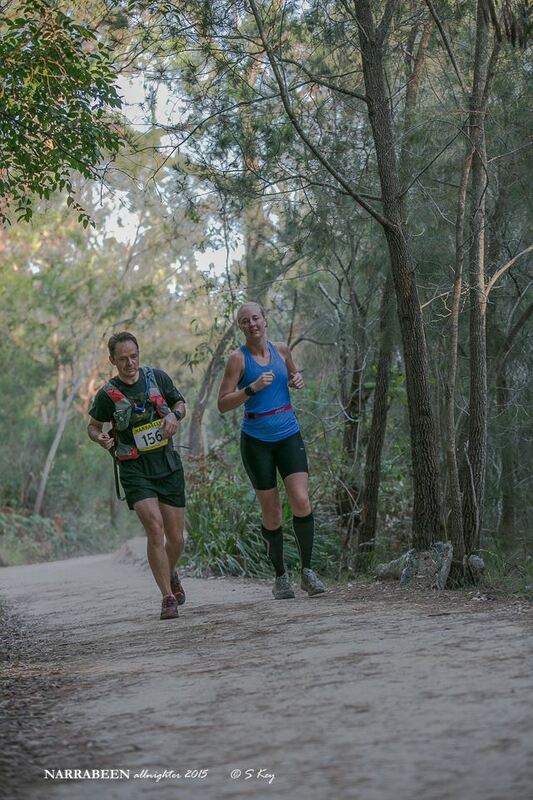 with Sam chasing her tail very closely, Wayne was holding onto 2nd and looking determined, my mate Darren was still going strong and we ran together for part of what was going to be his final lap (picture below). You guys are the best!! I hit a speedbump at 37km and had been walking sections of the laps. I was feeling light-headed so kept stopping to walk when it got really bad but it made the knee feel 10 times worse when I walked. I was out of ideas, so I just kept alternating walk/run. But seeing these familiar faces and hearing the support from others out there I pushed and ran some more to make sure that I’d hit 50km before the time ran out. I saw Andy from Striders on one of my final laps and also Tanya & her kids, Carolyn, Nigel and Em’s lovely family. They cheered us on and my mood lifted a little, so great to see familiar faces and know they’d be there when I finished. Eventually I crossed the finish line and squinted at the bright sun now pouring over the lake and Jamieson Park. I stopped my Garmin and headed over to meet everyone and get into recovery mode. My team mate Brad and i were all thumbs up and very happy with our results. Between us we had managed to run 100km in under 12 hours, woohoo!! I still felt quite dizzy and my right leg started to cramp up too, I’ve never had that happen in a race before! Thankfully my buddies Nigel and Carolyn were keeping an eye out for me and they assisted me to remove my shoes and socks, elevate my legs, feed me bacon & eggs, and got some gel for me to rub on my cramping hamstring. I also sculled some electrolytes to help get the salt back into my body and hopefully stop the cramping. Here’s me stuffing my face with bacon (yum). it defintiely took my mind off how sore my knee was feeling too. Emma gave me a compression bandage for my knee and I took some pain killers, i also made a mental note to ice the knee and elevate it for the rest of the day/night. I hoped it wasn’t anything too serious, but only time will tell. Within about 20 minutes the dizziness stopped and I began to feel much better. We all chatted about the course and our run and how much we enjoyed it, then packed up our gear and the cars and headed over to the presentation area for the awards. 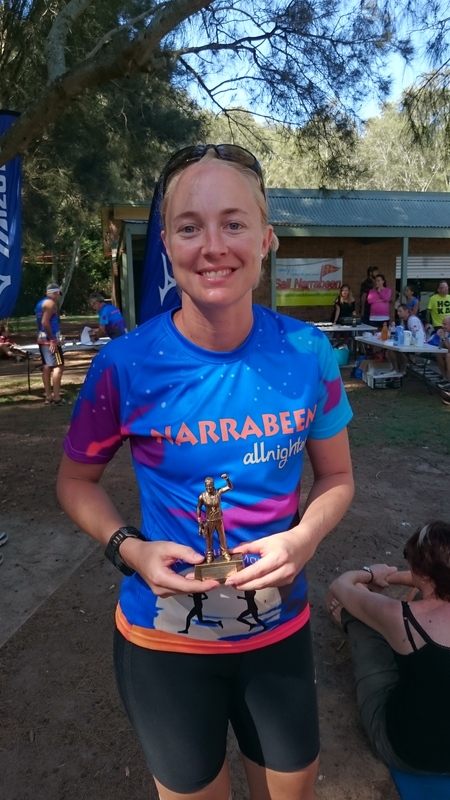 Would you believe that I actually scored the ‘Courageous’ female runner award due to the fact I had taken a bad stack early in the run yet kept going. I didn’t even know such an award existed and I think I know who to thanks for the nomination (Nigel? ), ha ha. Here’s me accepting the award from organisers Horrie and Ron. And how tired do i look here!! 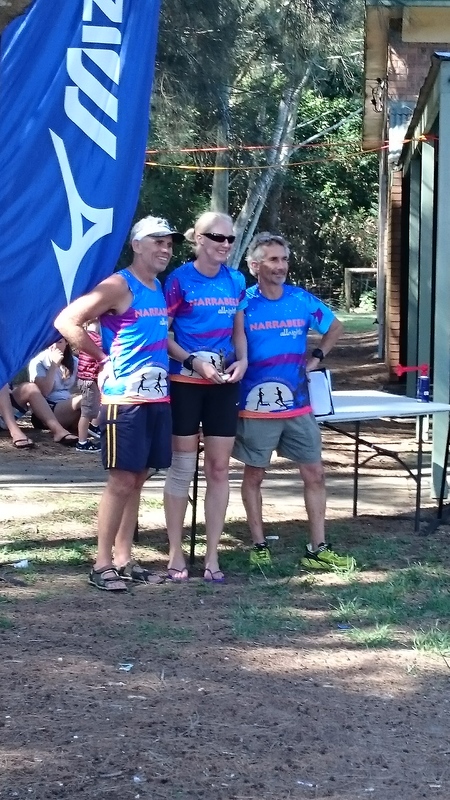 I want to send a big, no huge THANK YOU out to all the organisers, volunteers, crews and runners in the event. 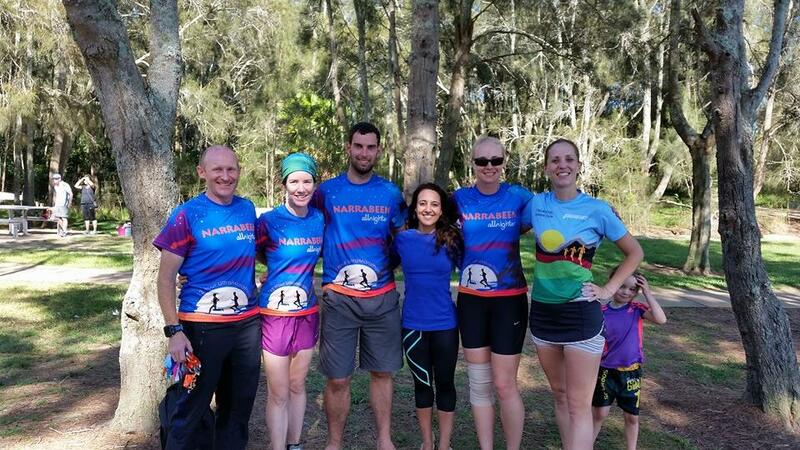 It was well organised, well supported and without the friendly runner camaraderie it would not have been the same. This was a great event that i will not forget in a hurry and I encourage anyone who is thinking about doing it in 2016 to sign up now!! Congratulations to all the runners, new friends and old. We are a crazy bunch of people but you are what make it so special. I hope to see you all on the trails again soon. Packing for an ultra marathon is a little bit like packing for a holiday. You write your list of clothes and items to take to cover all bases, then you end up over packing and only wearing/using half the items in your luggage. But that won’t stop me doing it all again next holiday, but I have learnt to pack a little smarter for my ultras. 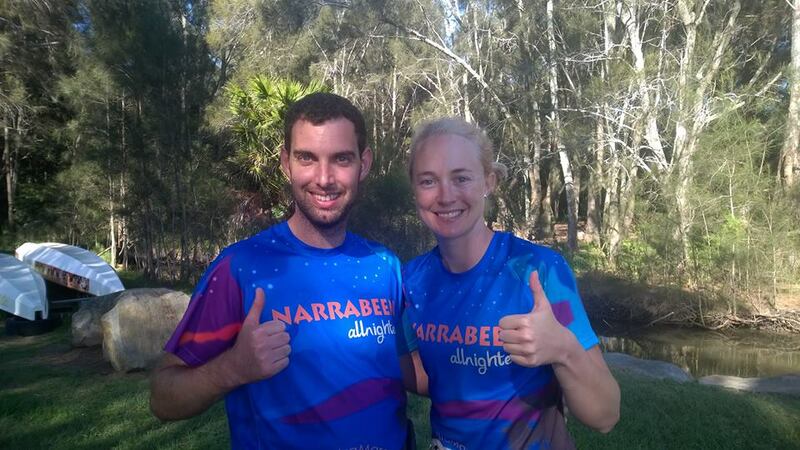 On Saturday my friend Brad and I will be running the Narrabeen Alnighter which involves us running 6 hours each in blocks between 8pm to 8am. I scored the second half of the journey so my run commences at 2am Sunday morning after Brad has been running for 6 hours. 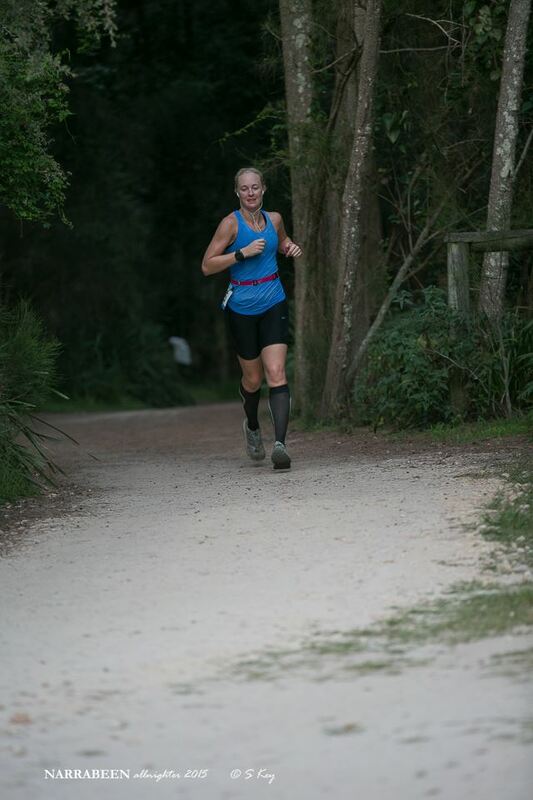 The course we run on is a 5km trail loop and the aim is to run as far as you can in the time given. Brad and I are both aiming to reach 50km so if we can reach 100+ total that would be awesome! So that’s where the packing comes in, to run 50km, or to run for 6 hours means that you need to have a plan for Nutrition and clothing. It’s summer here so could be very hot, which means very sweaty, so a change of clothes is needed. I think I might also take a second pair of shoes to put on if needed too. I also plan to use Cliff bars and gels for the run, along with water and Shotz for electrolytes, as this is what I have used in the past and never had any issues. And you never change anything on race day. 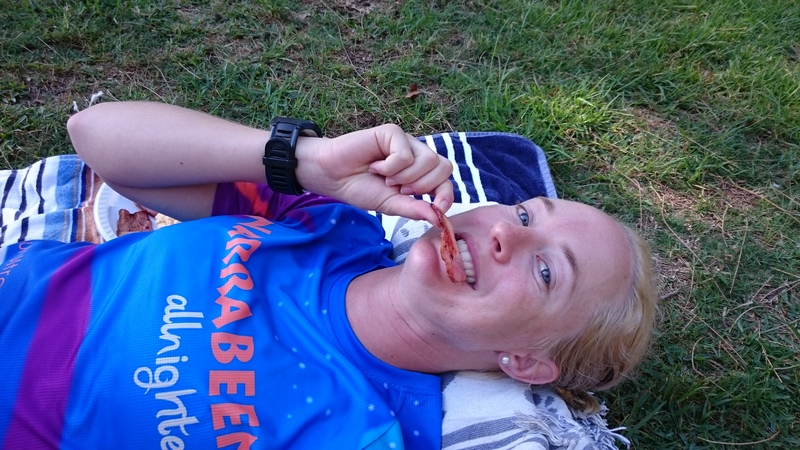 I also like to have real food during long runs, so will probably throw in a few vegemite or nutella sandwiches (or both) and some rice pudding, gummy bears, bananas and coke. Wishing all my other running mates a happy run for this weekend, some at the same race as me and others like Ganesh doing his first 12hr race in Singapore – Go Ganesh! We will be thinking of you during our run too, run strong! I can’t wait to hear all about your journey and I know you’ll be fantastic!